Download the RPM package and install using rpm (not advisable). I used the make-sqldeveloper-package, which is available for Debian and Ubuntu and it’s derivatives. However, the man page and the instructions are little unclear on how to use it. You need to download the zip file available at Oracle’s (and not the RPM file nor any of the other packages) and then use the make-sqldeveloper-package to convert it to a DEB which you can then install using the dpkg command. This is preferable to using rpm or alien as you can more easily manage the package using Debian’s and Ubuntu package management tools, plus it will integrate SQL Developer into Gnome’s Menu System . 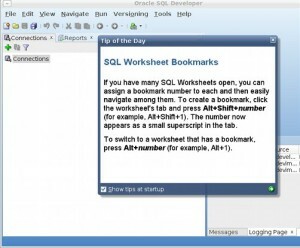 Plus, when Oracle updates their version you can use make-sqldeveloper-package to create an updated DEB package and easily update the version you have installed. The procedure outlined below works on Ubuntu Karmic and should also work on any Debian version that has the make-sqldeveloper-package. This utility will require you to download the “Oracle SQL Developer for other platforms” archive from <http://otn.oracle.com/software/prod‐ucts/sql/> to create the Debian package from. You will need Ubuntu’s multiverse software repository. See the instructions on how to do so. Thanks to Miles for the tofrodos tip. In my example, I’m going to use /tmp/ORA as the build location and the ZIP file has been download to my Desktop (~Desktop). make-sqldeveloper-package: Building sqldeveloper package in "/tmp". Note: You will need a JVM installed for the tool to run. Updated September 27th 2010. Added instructions from Miles on installing dos2unix alternative for Ubuntu Lucid. The dos2unix command is not available in Ubuntu Lucid.